The hotel industry is the latest to jump on the weed-centric band wagon. The good people of Colorado already have access to some pretty incredible weed-infused treats, but soon, they’ll also be able to check in at a “Bud and Breakfast” for the weekend. Yes, you should move there immediately. The MaryJane Group, Inc. has signed a one-year lease with the owners of Adagio Bed and Breakfast in Denver, Colorado, and plans to transform the quaint little place into “the first all-inclusive ‘Bud and Breakfast,&apos;” catering to clients who wish to have a cannabis-infused vacation. According to the company’s press release, “all-inclusive” means the following: no caps on food and drink, and of course, “the best marijuana and marijuana goodies Colorado has to offer.” Guests will also get hooked up with an on-site chef whose duties are to prepare gourmet food cooked to order, for times when those munchies need tending to. Details about the name of the hotel, room rates, and the exact opening date have yet to be released. 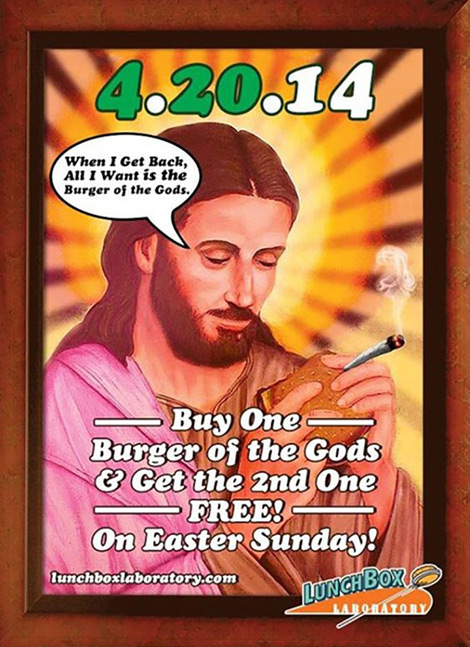 The company has not officially advertised the B&B, but we hope that when they do, they learn a thing or two from this restaurant in Seattle that announced their Easter Sunday special with an ad featuring an image of Jesus smoking pot. Joel C. Schneider, President and Chief Executive Officer of the company, stated that if the Bud and Breakfast proves successful, the MaryJane Group will look into extending the lease, or acquiring additional inns and B&B establishments. We don’t see how this could possibly fail.